Medium sized evergreen with felty young shoots of oval to lance-shaped dark grey-green leaves covered with a brown or silver indumentum, denser on the undersides. 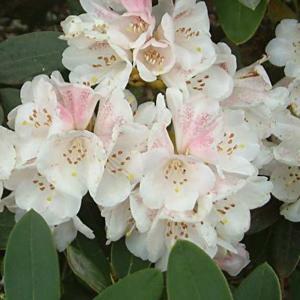 Large trusses of broadly bell-shaped, white to pale-pink flowers, sometimes spotted inside, in March and April. Introduced from Taiwan by John Patrick in 1972.